When Jaylin was born with Down syndrome and a complete AV canal defect, the lifelong stampede of doctors and clinic appointments became just another part of her journey. At the age of three, and countless appointments later, Jaylin had her first visit with Dr. Feingold in The Feingold Center. I was apprehensive about adding yet another doctor to the list of specialists Jaylin saw, but was encouraged by many families in the Down syndrome community that it was worth it. 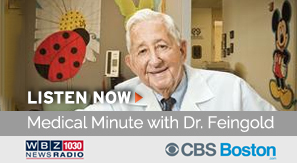 The level of care that Dr. Feingold offered did not just come from his expertise, but from his genuine care and compassion for each of his patients. I remember the first visit we had with him, he looked over Jaylin as any doctor would, but what stuck with me was that he also looked at her one year old sister. For a physician to see more than just the patient is rare. He looked at the whole family structure. That day, he noticed that Jaylin’s typically developing baby sister had the curved pinky finger trait that is a marker for Down Syndrome. I use this little piece of knowledge that Dr. Feingold shared with us whenever the differences between the sisters seems too vast to remind them that they are more alike than different. A few years, and a few uneventful but pleasant visits with Dr. Feingold later, I was back in his office with Jaylin and three of her sisters. This time, there were more questions. Jaylin had been having a lot of self stimulatory behaviors and was very introverted. I was overwhelmed, and that day in the clinic was so chaotic. I had four small children, Jaylin being the oldest at seven, in a small office, and was explaining to Dr. Feingold that several doctors were running tests on Jaylin to determine if she had a dual diagnosis of Autism. I wanted his opinion more than anyone else’s because he had worked with children with DS for so long, I trusted him and what he would tell me. As we were talking about my fears and how I didn’t want another label placed on my child, he reassured me by saying that we didn’t have to make any decisions then, but would just “wait and see” because kids with DS had odd behaviors from time to time and doctors were being very quick to give them other diagnoses. Then, he turned around on his chair to look at Jaylin, who had spent the time we were talking to shred an entire box of tissues all over the floor. Very calmly, he turned back around and said, “Okay. Maybe it is time to see about that diagnosis and what we can do for her”. He, with only the way he could, let me know that her behavior was not typical for Down syndrome, but handled it with a bit of comic relief and his recommendation allowed me to pursue the testing that would ultimately get her the dual diagnosis and the extra help she needed. This December, Jaylin will be twelve, and has made so much progress from the little girl who was in her own world during that visit with Dr. Feingold. The annual Christmas party is a favorite in our family, especially for the fact that Jaylin is not the only one celebrated during the event, but her sisters as well. From the very first visit with Dr. Feingold, he embraced the whole family unit, and not just the child seeking treatment. The very special person that Dr. Feingold was is apparent every year at the holiday party, an event much appreciated by all of the families who attend. I am very grateful to Dr. Feingold, and everyone at The Genesis Foundation for the commitment to family.